I'm always looking for hair products that will not only keep my hair looking shiny, but will also keep it healthy as well. So I was really excited when I was sent a few new items from Dove's Vitality Rejuvenated Line. Dove Vitality Rejuvenated replenishes hair’s essential nutrients lost as women age, and restores hair’s youthful abundant look and feel. It is expertly formulated to deeply nourish while re-densifing dry, dull locks, bringing back their once youthful appearance. I was sent the shampoo, conditioner and also the Silk Creme. I absolutely loved the Dove Vitality Rejuvenated Shampoo and Conditioner. Both left my hair looking healthier and feeling fresh. Although I'm still young and this line is geared to older women, I'm really glad I got a chance to try these products. Over the last few weeks of using the products, I've been receiving lots of compliments and was asked frequently if I got my hair done. It was shiny and luscious and I can easily recommend this line to other people. I also got to try the Silk Creme, I wake up to my hair looking like a frizzy mess, so once I've washed my hair and in between blow drying and straightening my hair, I use the Silk Creme, which has been working great, leaving my hair looking fuller. I have already been noticing positive significant differences due to this product and am loving it. 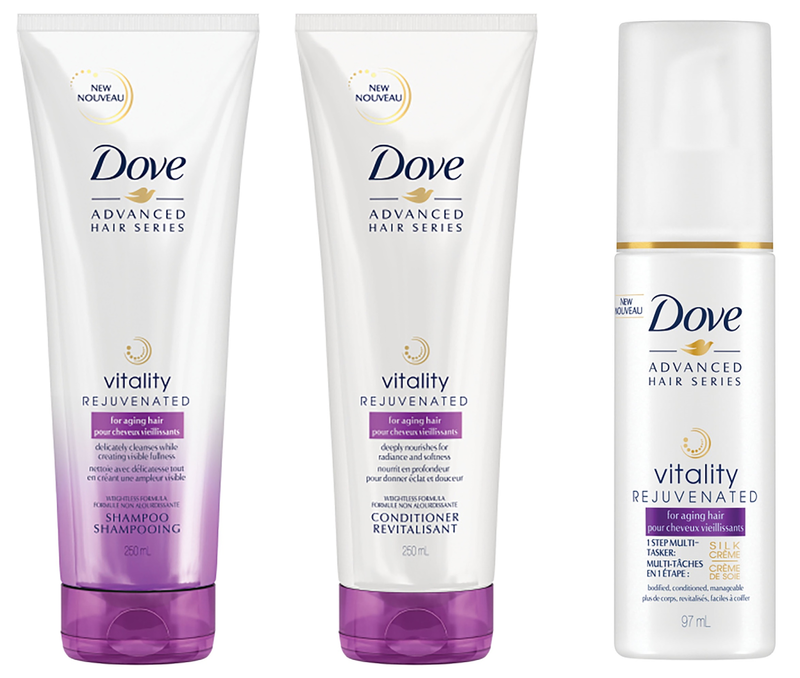 The Dove Vitality Rejuvenated line can be found at a store near you with each product retailing between $6.97 - $7.98. To find more info about this line and other Dove products be sure to head over to www.Dove.ca. Disclosure: All opinions are my own. I received Dove Vitality Rejuvenated Line at no cost for the purpose of this review. No other compensation was received.